The modern and stylish gentleman needs a luxurious and professional looking briefcase or bag to complement their style. This is particularly necessary for those who work in high profile jobs or in jobs that require a classy appearance. This is where the Polare Real Cow Leather briefcase comes in, which is of a similar style to the Saddleback leather briefcase but is cheaper in price whilst still promising high quality. My article will look into the quality and design of the Polare briefcase compared to the Saddleback briefcase and decide whether it’s worth spending a little less without having quality compromised. 100% Cowhide Leather: High quality leather material which is soft yet still gives the briefcase a luxurious and stylish look. Versatile: Can be used as a laptop bag, messenger bag, backpack or as a briefcase. Waterproof: Designed to be useable outdoors with the top leather layer which ensures rain will not seep into the briefcase so your possessions will be kept dry. Spacious: A lot of room to store possessions for daily use or for an overnight trip. Buckle Fastening: Can be quite fiddly and time consuming to open and close when in a hurry. Fits Laptop Screen Size Up to 17.3"
Dimensions (inches) - 16.5" x 12" x 9"
The Polare real cow leather briefcase is made with Italian imported thick cowhide leather in either a rich brown or light brown color. Compare this to Saddleback Leather who offers four different colors for their classic leather briefcase. However, dark and light brown is a color that can be easily matched and complemented to almost all colours. The Polare briefcase is held together with strong stitching in a similar brown color. This gives the briefcase a professional yet luxurious look, perfect for modern stylish gentlemen. Smell and Color Leak – At first, there may be a chemical or strong leather smell but this goes after a while because it just needs to be aired out and the briefcase is a darker color but it lightens after a few uses. The color will not rub off onto your clothing which unfortunately is what the Saddleback leather briefcase tends to do upon the first few uses. Size – It measures 16.5 inches in length x 9 inches in width and 12 inches in height which is slightly smaller than the extra-large size of the Saddleback leather briefcase. Durability – Polare intends for the briefcase to withstand the rain so your items will stay dry. As the material is thick, it does actually keep items inside the bag dry and the bag doesn’t absorb any water either. The leather feels very strong which suggests it is quite durable and should be able to withstand regular daily usage. D-Rings – Several silver metal D rings are fitted on the briefcase and with the removable strap, these allow for the versatile use of the briefcase. Two are on the back bottom, three on both sides around the top and one in the middle top just behind the handle. The strap is adjustable with the buckle and perforated holes and has two movable pads. Closure – A flap is used to close the briefcase and secured down with a buckle and strap with perforated holes in the middle of the briefcase. This is quite secure which makes it harder for thieves to access the bag and it allows users to adjust the tightness of the flap accordingly. For extra security, there are two additional straps and buckles on the front of the bag on each edge. If these are not needed, the straps can be easily slipped up and held in place with the leather slots at the back of the flap. The design of the Polare real cow leather briefcase is similar to the Saddleback leather briefcase so there is not much difference in style. This is ideal for men aiming for a classic and smart appearance. The buckle straps can be a bit of a nuisance to open and close for some people when they are in a hurry but because the leather of the straps is quite soft which is easier to pull into the buckle to fasten. The leather straps in the Saddleback leather briefcase are quite stiff which makes it hard to pull through the buckle at times. Although the leather is quite thick, it is not stiff. It’s fairly soft but not too much that it will fall over when it is set down. The softness allows the bag to be quite flexible which gives it more room to store possessions. You could easily fit a spare change of clothes, toiletries, a laptop and a few thin files for daily work life or for an overnight business trip. The leather on the Saddleback is more stiff which is quite inflexible. A versatile adjustable strap allows you to turn the Polare leather briefcase into a backpack. With the adjustable strap and pads, the briefcase can be worn across or on the shoulder as a messenger bag or on the back as a backpack. Alternatively, the strap can be removed so it can be used as a laptop bag or briefcase by the padded handle on the top. It is simple to remove the strap as it is a metal spring clip. The Saddleback briefcase also has this same versatility. 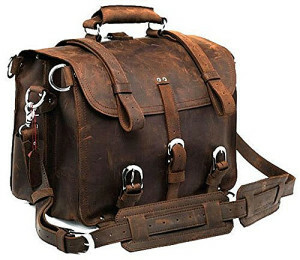 Due to the thick leather, the bag can get quite heavy after carrying it around for a while. It is still a lot lighter than the Saddleback leather briefcase. The weight of the Polare leather briefcase when empty weighs just 5.6lbs whereas the medium size of the Saddleback weighs 6.6lbs. Despite the weight, people have found it comfortable to carry the Polare Real Cow Leather Briefcase around whether it is by the handle or on their shoulder with the pads because of the softness of the leather which means no hard corners. 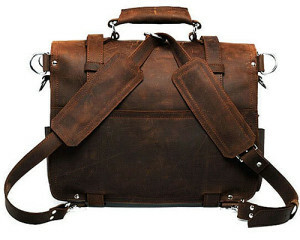 Hard corners such as those on the Saddleback leather briefcase can hit against your leg which gets quite uncomfortable. Whilst many like the large size of the bag, some find it too bulky making it awkward to carry on their shoulder. Luckily the size is not overly big as it can be taken on airplanes as carry-on luggage which will also fit under the seat. As with all leather products, some maintenance is required to ensure the briefcase retains its quality. Leather conditioner may be used every so often to protect the leather. When you open the flap to the briefcase, you will see accordion style compartments similar to the Saddleback briefcase. These are two large compartments which are very roomy. Stitched into the middle divider are two smaller open pockets which can be used to store smaller items such as your mobile phone, wallet or chargers. Although there are not as many compartments as the Saddleback leather briefcase, the size of the Polare leather briefcase can fit laptops up to 17.3 inches whereas the Saddleback’s large can only fit laptops up to 15 inches despite the similar dimensions of both bags. There aren’t many compartments but it’s very spacious and flexible inside. There is no separate laptop compartment or a security strap to hold the laptop in place to prevent it from moving about. However, people with a 17 inch laptop find it doesn’t tend to slide about because their laptop fits snugly into the briefcase. On the outside of the briefcase, there is one open pocket stitched on the side. This is big enough to fit quick stash items such as tissue, pens or a can of soda. Although the Polare does not have as much compartments as the Saddleback leather briefcase, this briefcase is quite spacious due to the softness of the leather and generous size. Having too many compartments will only reduce the amount of room the briefcase has for larger items such as files. The craftsmanship of the Polare briefcase shows superior quality and design but also sturdiness and durability. 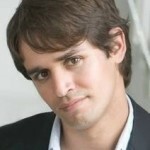 The classy style is suitable for professional and stylish men as it helps to complete their smart appearance. It can be used for everyday use for work and even overnight business trips. The Polare real cow leather briefcase pretty much does the same thing as the Saddleback classic briefcase (read my review here) at a third of the price. You will still get high quality, versatility and style without having to spend a fortune. The leather material used in the Polare will ensure the briefcase will age well and last a long time so it will be money well spent.